On the day that a new report (1) from the Scottish Federation of Housing Associations (SFHA) sets out just how costly further UK Government welfare reform could be, the Department of Work and Pensions (DWP) has announced (2) that its own policy to cap Local Housing Allowance (LHA) for supported accommodation (SA) (3) will be put on ice until 2019. This is to give proper time for the DWP to consult on the detail and stave off the potentially devastating consequences for vulnerable people which the SFHA has highlighted in its new report. The DWP will keep the LHA cap for supported accommodation but will pass funds to the devolved administrations to make up the resulting shortfalls, making the Scottish Parliament de facto responsible for dealing with the issue and the impact, in what could amount to a re-run of the ‘bedroom tax’ implementation north of the border. “The DWP announcement merits a cautious welcome as it gives us all more time to work out exactly how we are going to prevent costs of between £4.3 million and £5.6 million a year (4) hitting vulnerable supported accommodation tenants in Scotland – and by default their social landlords. Unfortunately, it does not address our concerns about how single people under 35 who are not in supported accommodation but who are still ‘at-risk’ will cope with imminent reductions in their social security payments. “The DWP’s intention to hand over supported accommodation funds to Holyrood means it is more important than ever that the Scottish Government sets out its initial position in relation to this critical issue especially given the its ambitious target to build 50,000 more affordable homes, some of which will have to be for supported accommodation. 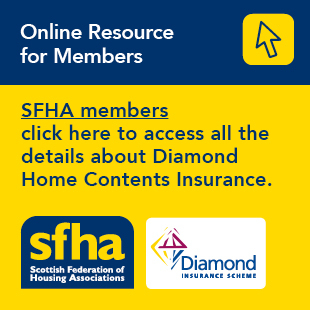 “If housing associations don’t know whether the social security system in Scotland will protect vulnerable people properly – that is, by paying their rent – and won’t really know one way or the other for another three years, they are unlikely to take on the significant financial risks of building and developing more supported accommodation. Delaying the introduction of the policy until 2019 does not address this issue. Building houses is quite obviously a long term process with extensive lead in times that cannot simply be frozen and unfrozen at will. Below are two case studies that are illustrative of the policy’s affect. N.B. The LHA cap policy as it applies to single tenants under 35 applies to tenancies taken up from April 2016 and payments will be capped from April 2018. The LHA cap policy as it applies to tenants in supported accommodation has not yet been introduced, and when it does, it will only apply to tenancies taken up immediately after its introduction as opposed to tenancies that exist prior to that. Obviously this means that, so far, few single tenants under 35 and no tenants in supported accommodation are affected. These cases studies then are anonymised examples based on real life current tenants (one under 35 (Linda) and one in supported accommodation (Andrew)) and are given to illustrate the types of people and circumstances that will be affected by the policy when it kicks in. Linda and Andrew (not their real names) are both tenants with Horizon Housing Association which is part of Link Group. Linda is 23 years old and was nominated for housing as a homeless person. She had recently fled domestic violence and was living with family and sleeping on the sofa. She was already in receipt of Employment Support Allowance and was supported to make a claim to the Scottish Welfare Fund to access essential items to set up home, including white goods and a bed. She now lives in a one-bedroom housing association flat. The current monthly rent is £315.92. The LHA shared room rate for her council area is £60.00 per week/£260 per month. If Linda was to start her tenancy today, under the LHA maxima, from April 2018 she would face a shortfall of £12.95 per week/£56.14 a month. The possibility of losing her tenancy could put Linda’s physical and mental health and wellbeing at risk, and there is a risk that she could end up returning to the domestic abuse situation if she lost her tenancy, putting her in potentially serious danger. Andrew lives in shared supported housing, sharing his home with one other person and a sleepover staff member. He pays a share of a rent on a four-bedroom property which was purpose designed and adapted for people leaving hospital. When he moved from hospital, Andrew had barely left his ward in over 15 years, never saw his family and was highly dependent on medication. Andrew currently pays £452.52 per month, which includes furniture, decoration, enhanced maintenance and adaptations. He gets full Housing Benefit. Under the LHA maxima, he would only be entitled to £68.28 per week/£295.88 per month. The shortfall of £156.64 per month/£36.14 per week would be unsustainable for any new occupant who would likely end up in hospital or a care home instead.